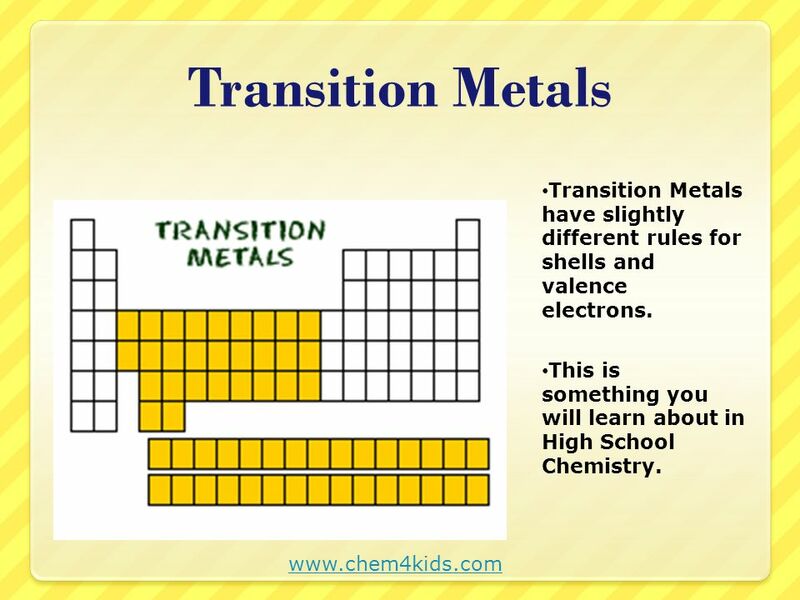 4 Transition Metals Transition Metals have slightly different rules for shells and valence electrons. This is something you will learn about in High School Chemistry. 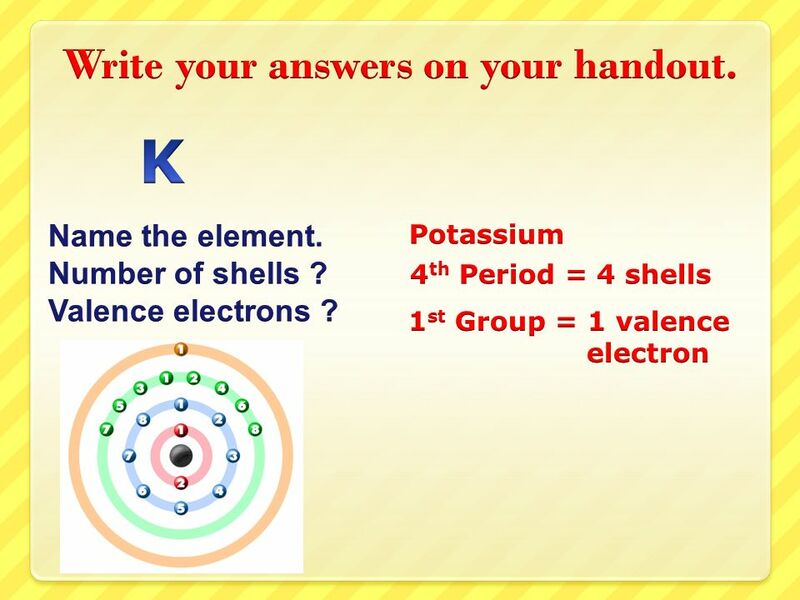 7 Write your answers on your handout. Ne Name the element. Number of shells ? Valence electrons ? 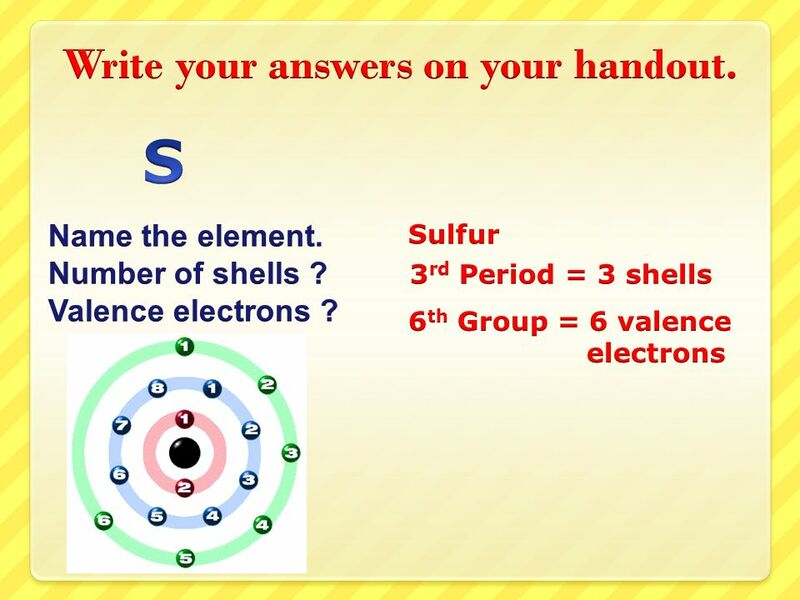 8 Write your answers on your handout. 9 Write your answers on your handout. Name the element. Number of shells ? Valence electrons ? 10 Write your answers on your handout. 11 Write your answers on your handout. Be Name the element. Number of shells ? Valence electrons ? 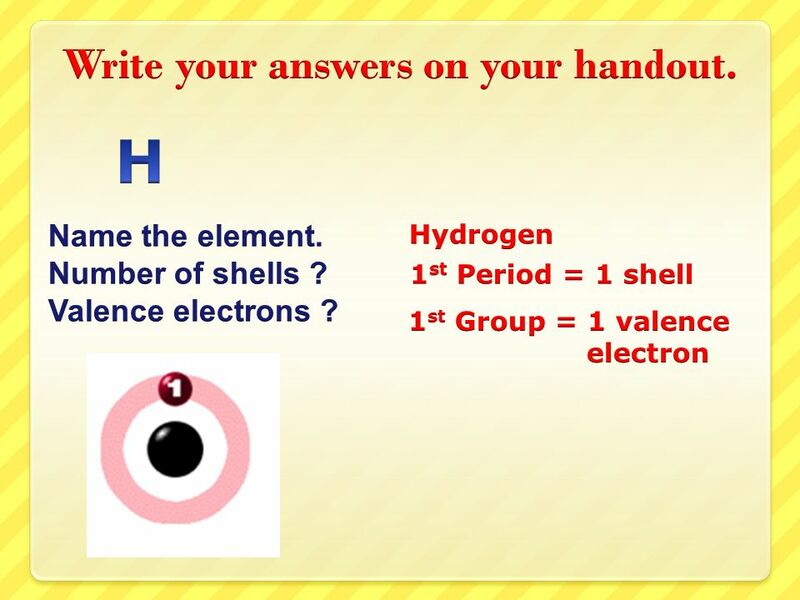 12 Write your answers on your handout. 13 Write your answers on your handout. 14 Write your answers on your handout. 15 Write your answers on your handout. 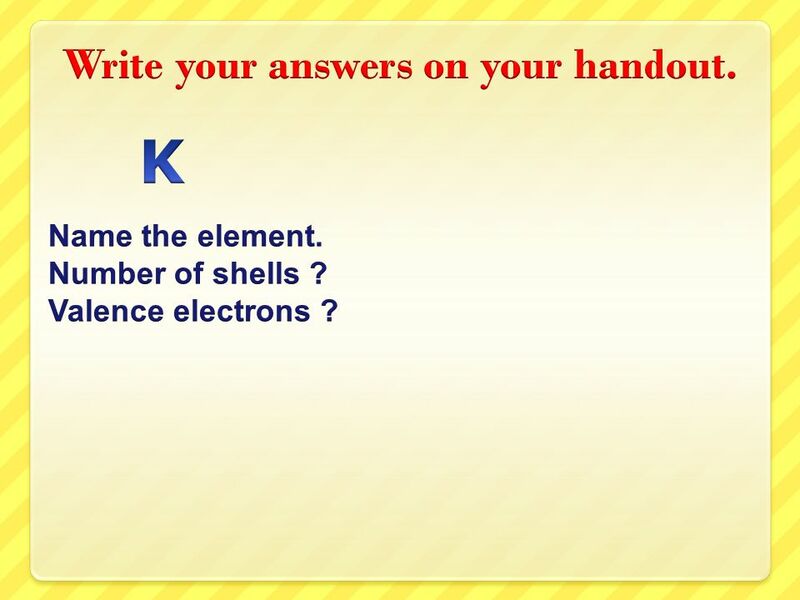 K Name the element. Number of shells ? Valence electrons ? 16 Write your answers on your handout. 17 Write your answers on your handout. 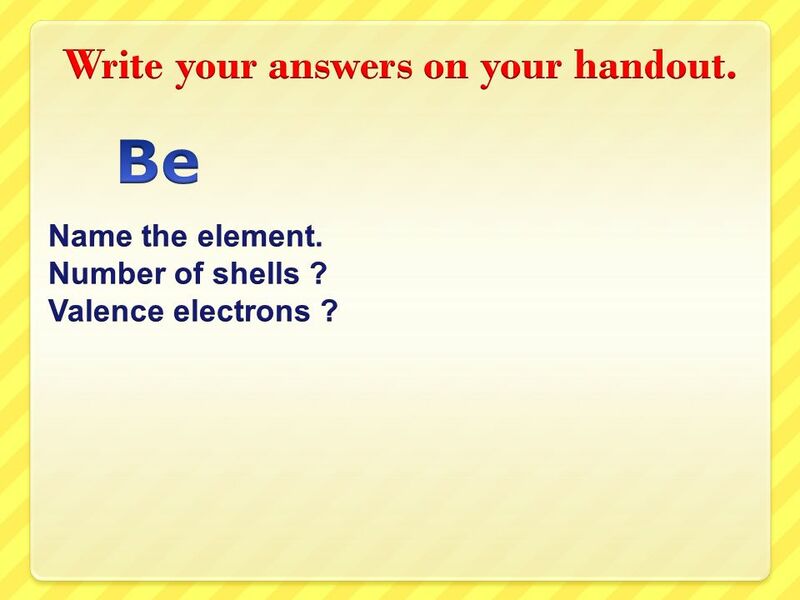 He Name the element. Number of shells ? 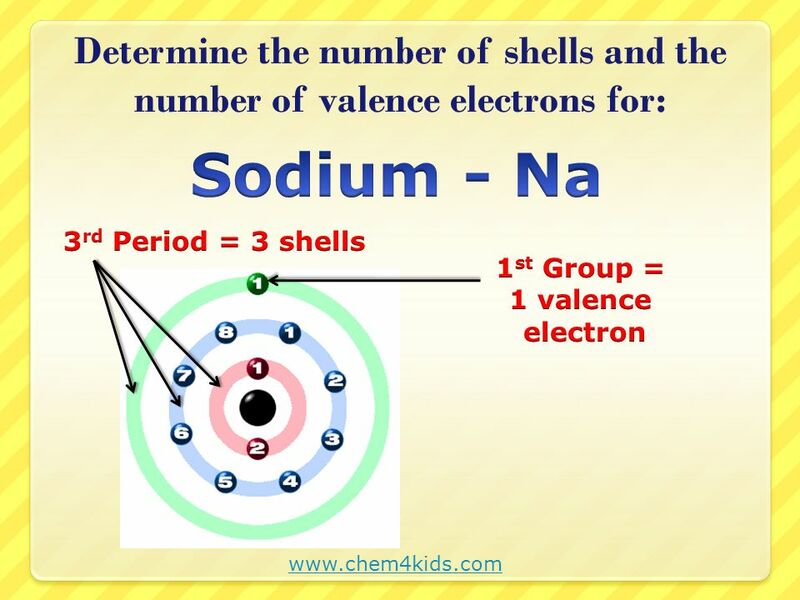 Valence electrons ? 18 Write your answers on your handout. He Name the element. Number of shells ? Valence electrons ? 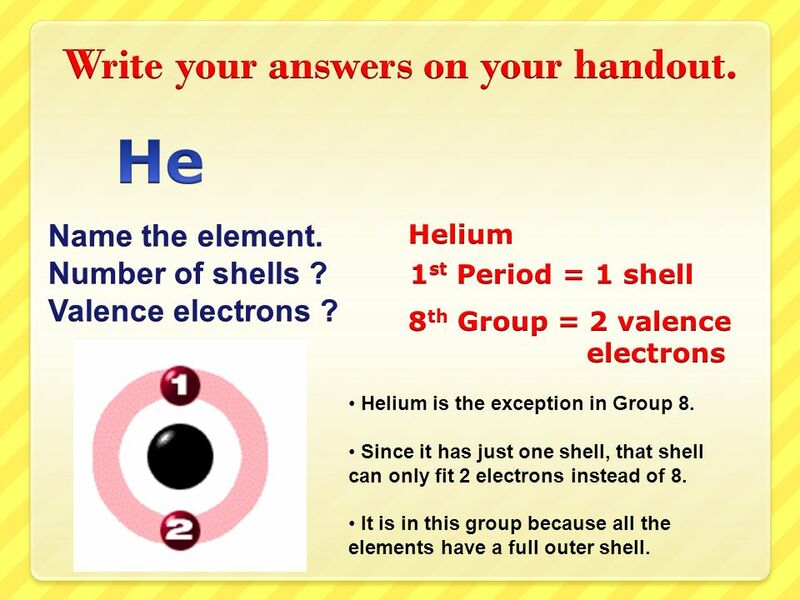 Helium 1st Period = 1 shell 8th Group = 2 valence electrons Helium is the exception in Group 8. Since it has just one shell, that shell can only fit 2 electrons instead of 8. It is in this group because all the elements have a full outer shell. 19 Be sure to have all your answers on the worksheet. 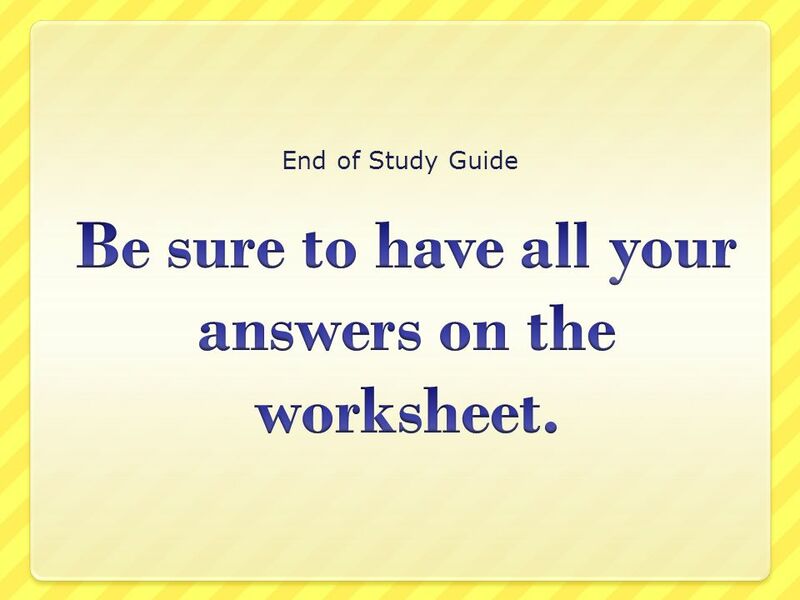 End of Study Guide Be sure to have all your answers on the worksheet. 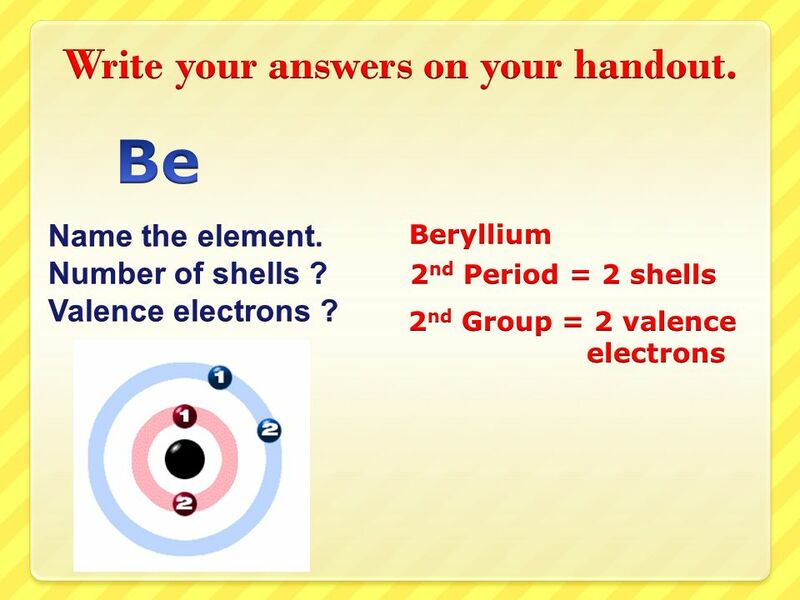 Download ppt "Periodic Table Study Guide Determining Shells and Valence Electrons"
How to Draw Bohr Diagrams. 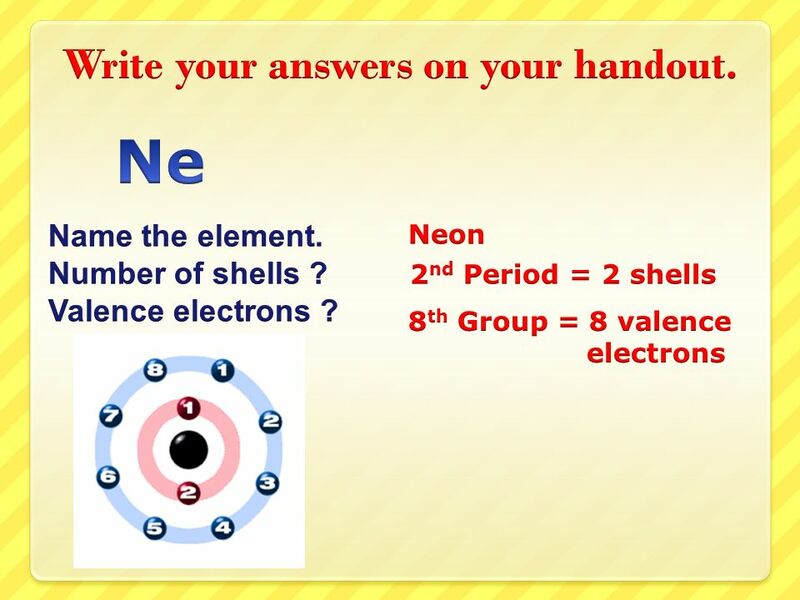  Electrons are arranged around the nucleus of the atom in orbitals or electron shells. Each orbital can hold a maximum of two electrons. Periodic Table of the Elements. u These are called the inner transition elements and they belong here. How to Draw Lewis Structures. 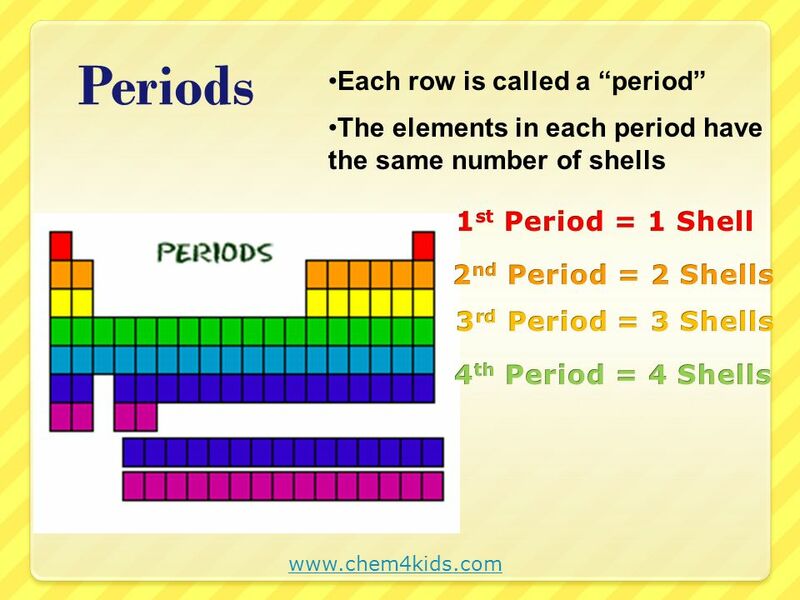 Lewis Structures 1)Find your element on the periodic table. 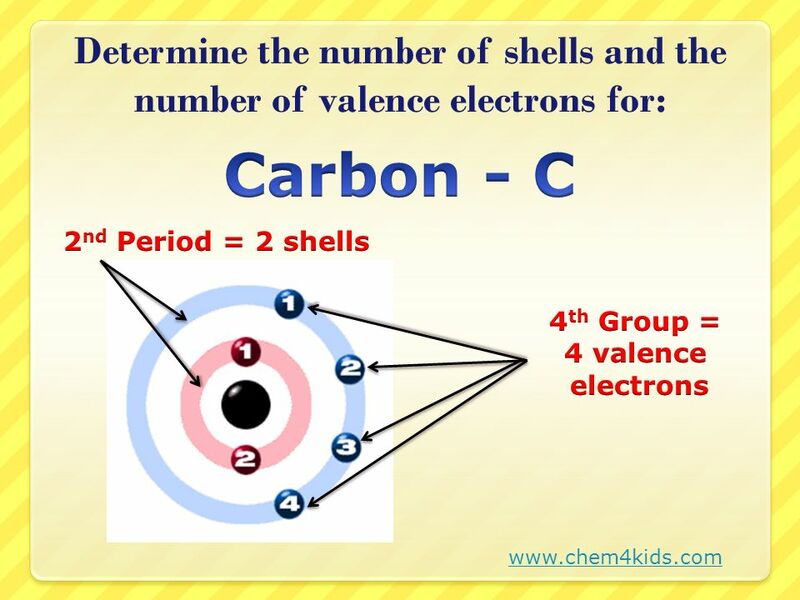 2)Determine the number of valence electrons. 3)This is how many. Chemistry Ms. Piela. 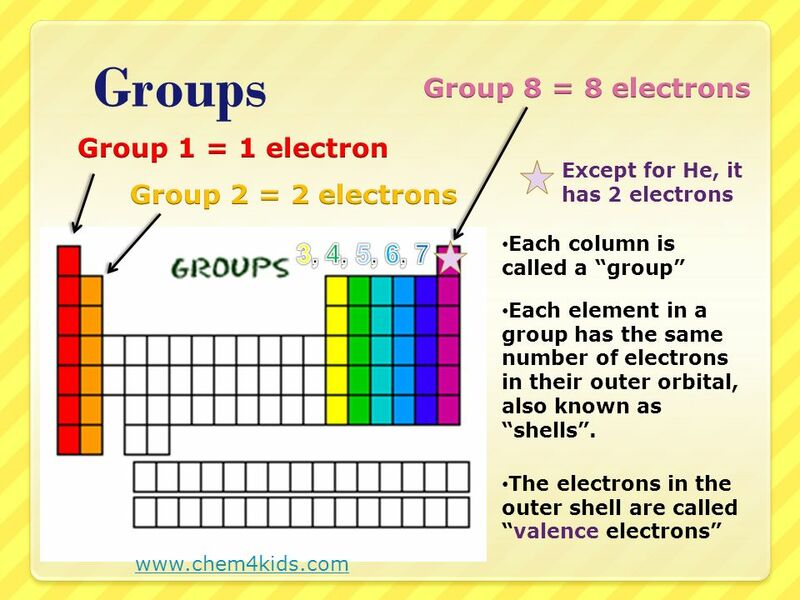 Periodic Table  Group – Vertical columns on PT  Period – Horizontal rows on PT. 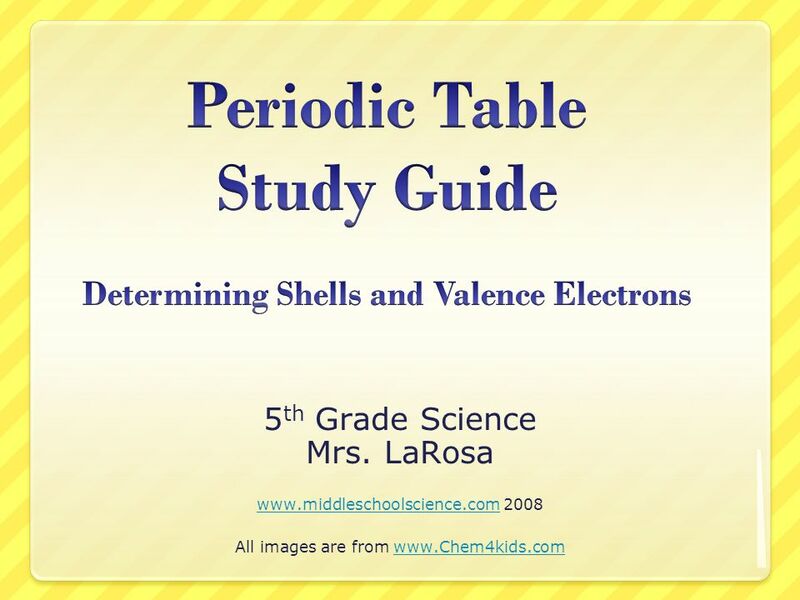 Periodic Table Study Guide 8 th Grade Mrs. Jenkins How to Draw Lewis Structures.